You can wash your own delicate fabrics. You just need the right product and the right mindset. We tend to rush out to the dry cleaners whenever our fine wools and linens get even slightly dirty. Calling this one from personal experience, cashmere and lambswool can be dealt with at home with the proper tender care. The right chems is the first start. 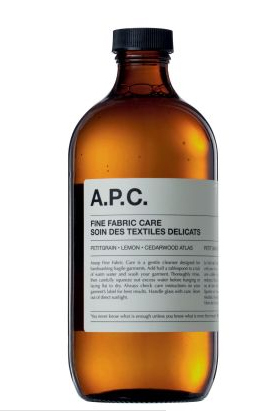 Formulated for A.P.C. by Aesop chemists, it contains extracts of pettigrain, lemon and cedarwood. This lab tested compound eclipses even baby shampoo as the safe option for hand washing your delicates. Experiment with an old sweater before you start scrubbing your knit ties, but by doing you are further clearing the path towards independent formal wear maintenance. Available online. This entry was posted in Accessories, Misc, News. Bookmark the permalink.